What’s that you say? We’ve hit Ipswich? That’s right, beautiful people, we have. !nd we’re extremely pleased to be here! So we’ve ditched the rehearsal room (we love you 3 Mills) and have migrated North East to the sunny plains of Suffolk ready to begin (duh duh duh) TECH WEEK! Now, like with everything, the Tommy company arrived in style, many of whom convened on Sunday night at one of the local watering holes, The Greyhound, as it had been a mean 48 hours since we had seen each other last and we, of course, had to share our epic car journey stories. Steve (Bass Guitar) had the pleasure of transporting lovely ladies Shekinah (Voice of Mrs Walker) and Natasha J (Dancing Beauty) to ‘The Switch’ and got a cheeky little workout in there too – by the means of carrying their gigantic (but necessary) suitcases into their digs upon arrival. Thankfully, I (Hawker) drove Adam (Drummer) down, who came with only a backpack and a ham baguette and could carry his own bag…Winner! Steve’s work was not done there however, as about 3 hours later he received an exasperated phone call from Shekinah: “Babe, what number is my house?” FYI, they’re not even in the same digs. 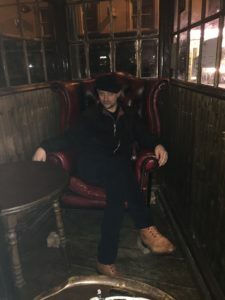 Meanwhile, Alim (Frank) and Julian (Voice of Tommy) were enjoying the ‘Crystal Maze’ Experience which, I hear they did pretty well at collecting their crystals and all, but did manage to miss out on us teasing the heck out of William (Tommy) about his impending leg waxing session! 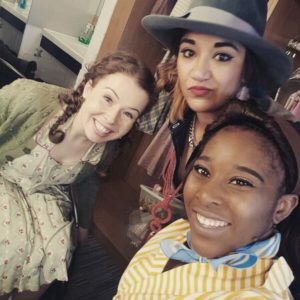 Amy Trigg, Natasha Lewis and Shekinah McFarlane in costume in their dressing room! 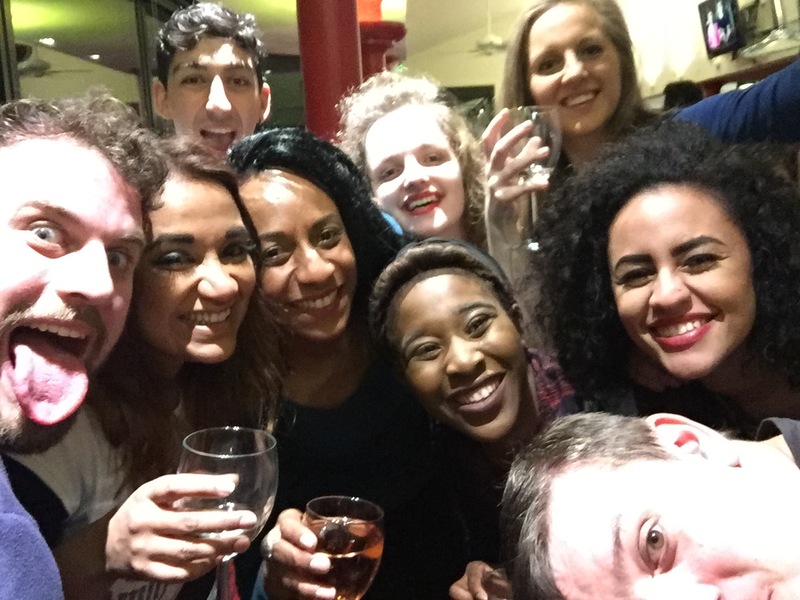 So tech week had arrived and on Monday, as we launched our happy little selves into the theatre, we were absolutely stunned! The set looked fantastic (thank you muchly Mr Designer Neil Irish) with many a colourful bulb and flashy (secret) prop for wonderful Arnim Freiss (Lighting Designer) to play with and make look spectacular! Although there was the small issue of a stage exit being blocked by a big old pillar which proved interesting for Amelia, one of our blind actors… but, no bother, we solved it because we are all super clever! That aside, all looked to be in order and everybody seemed remarkably calm. I always find it incredible when you see things you’ve so much about in rehearsals for the first time. Getting that perspective for me, is always a joy. Sarah Holmes (Fabulous Chief Exec at the New Wolsey Theatre) kicked off proceedings with a lovely welcome speech where we saw the entire team’s smiley faces for the first time. It was at this point that Julian (Voice of Tommy) noticed that he hadn’t yet located his French Horn. “Do you think they hid it?” was my helpful quip to him (wicked…but fun!). As Monday progressed it became apparent that all of the boys had been to the barbers and were all sporting very ‘1940’s’ smart facial art and hairdos…wow, now we know what you ACTUALLY look like…handsome buggers! Donna (Mrs Walker) had also taken a trip to the hairdresser and, it turned out to be a particularly ‘chatty’ time… no rest for the wicked Donna! Often the standard nightmare on a tech rehearsal will inevitably involve the dreaded quick change and this show consists of about a million of those (I never exaggerate) so it was time to figure those bad boys out. It took time, a whole lot of precious time (thank you for the words George Harrison), it did take patience and time, and now we’re doing it right… that’s what rehearsals are for right?! Thank goodness we had Danuta’s (Team New Wolsey Wardrobe) heavenly lemon drizzle cake and ever gorgeous Jeni Draper’s (BSL Wonder Woman) sensational chocolate brownies to get us through. After a hectic day of ‘figuring stuff out’ we all descended upon the public house, St Jude’s for a cheeky Diet Coca Cola and a packet of Scampi Fries where Julian, Rose (BSL Interpreter), Adam and Max (Mr Walker) got involved in a very fierce and competitive game of ‘Pop Up Pirate’ and the winner was….ROSE! Your prize is…you get to spend the next 2 weeks with us where, no doubt, you shall continue to defend your title! Tuesday was our second day of tech rehearsals where Lukus (Cousin Kevin) managed to acquire his very own personal ‘human fan’ in the form of our Company Manager, Patricia, who was using Draft 3 of the script to cool his moist brow. This act of kindness being slightly out of character for our wonderful CM, she pointedly yelled “WE’VE GOT A DEAL!”…intriguing! Later that day, with all the set flying about at a speedy pace, we saw Steve valiantly rescue a very valuable giant prop from a state of disaster as the golf buggy went rogue, running over Rob’s (Musical Director) foot…ouch! In other news, I walked into the very same pillar that I mentioned in ‘Chapter Monday’, and Amy (Sally Simpson) bowled up in a scene she didn’t belong to and fashioned the most spectacularly indiscreet exit to get out… cue: mass hysteria from Stacey (Mrs Simpson), so much love in the room! This was proved by Steve stating that “it’s rare when musicians and the Sound Department are on the same page”, Callum (Sound No 1) quickly responded with “we’re not on the same page, we all hate you!” followed by Max asking Patricia “Why can’t you smoke on stage until there’s a paying audience?” and her replying “Because….you can’t!” Glad we cleared that up then! And you’re not going to believe it but there was another cast birthday which equalled…more cake! Happy Birthday Oliver (Assistant Musical Director). It was Thursday that we had all been waiting for – a full dress rehearsal followed by… yes… our very first performance. That’s right… Preview 1! And what an incredible team effort for both! Having said that, Max came off after the dress exclaiming “That was my fault…and I know that” while Julian entered the stage in a state of undress to do a scene change explaining that he “had a calamity”…it’s all part of the preview ‘joy of learning’ process lads. Either way, the audience were on their feet by the end and we all felt like we were at the beginning of something truly special. We had to wait until Friday morning to see what our Director Kerry thought of it all and he seemed pretty chuffed! His notes session, however, was slightly upstaged momentarily by a man on a ladder behind his head in the window! This was followed by a valuable point from Shekinah…”My weave is sewn into my head, nothing else can be put into my head”… she was of course referring to #HatGate as opposed to general information! Kerry then helpfully asked “How are you getting on with that mask Amelia?” She responded with “I can’t see a thing, but what else is new?” Very good! Prior to our second preview I was reminded of just how hard our wondrous Stage Management crew work as I found lovely Emily (ASM) hurriedly eating her dinner on the ‘Xmas Dinner Prop Table’ whilst fixing stuff in the dark surrounded by an assortment of crackers and baubles. We LOVE you! It was all worth it though as we ploughed through preview number 2 and received another standing ovation. We love Ipswich! By Saturday we were all absolutely pooped but ready to go for one more show of the week. Even after Mark (choreographer) politely asked Hearns (Dancer) not to shake his legs during ‘Sensation’ as it looks like he needs the loo and Peter (Acid Queen) was advised to ‘close his legs…you’re a lady!’ But huge shout out and thank you award of the week goes to Rosie (ASM) for valiantly saving the kabuki (massive white sheet)!